What Is Ashwagandha Essential Oil? Very few of us may have ever heard of Ashwagandha or it’s essential oil until now – I know this because I only recently encountered it whilst doing research into the ancient practices of the Ayurvedic system of medicine (which I’ll explain later in the article). This amazing root (or the bush that grows from the root) goes by a variety of names, some of which might cause some alarm, but it’s really a completely non-toxic plant. The scientific name for the bush/shrub is known as Withania Somnifera, but the root is also often referred to as Indian Ginseng, Winter Cherry or Poison Gooseberry. As I mentioned earlier, the tree and fruit are completely non-toxic to humans, however research shows that the oil produced by the root of the tree is toxic to most insects and can be used as a natural pest-repellent. The amazing benefits of this plant and it’s extracts have been passed down for centuries, and played a vital role in shaping man’s first system of medicine, parts of which are still in use today despite our advancements in modern medicine. So I suggest that you keep scrolling if you’re interested in trying to treat your ailments, pains or illnesses in a holistic manner first, before taking a dose of pharmaceuticals as we’re so used to doing. You’ve got nothing to lose, and lifetime of natural health to gain! Firstly, it’s important for me to stress that the Ayurvedic system of healing is just that – a system. It’s not limited to single type of treatment or medicine, but rather a range of different holistic options that can be used together or individually to treat your health. It is one of, if not the oldest holistic healing system known to man, dating back to more than 3000 years ago. It originated in India and has been passed down mainly through oral tradition and was eventually codified in a written text known as the Rig Veda. The system is ‘holistic’ in the truest sense of the word. It seeks to find a balance between your mind, body and soul and is therefore applicable to a variety of factors in your life – the word ‘ayurveda’ actually means ‘whole body’. This should give you a good idea of why the term encompasses such a broad definition of treatments. Treatments in the Ayurvedic school of medicine may include massage, aromatherapy, diet based treatment, meditation and other cleansing treatments such as steam inhalation and the use of essential oils. One of the core tenets of the Ayurvedic approach to medicine is based on the belief that our body’s are formed on three main types of energy (or doshas) namely, Vata Dosha, Pitta Dosha and Kapha Dosha. Each type of energy corresponds with a list of different bodily functions and by determining what the problem is (or which part of your body it’s affecting), you can essentially figure out how to treat it. 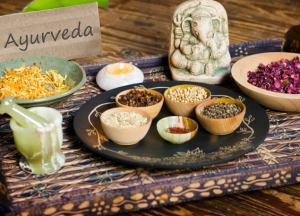 Although many of us might be put-off by the idea of subscribing to an ancient belief system, the fact is that many branches of holistic medicine are connected to the Ayurvedic methodology. In fact, roughly 90% of India’s population still make use of some Ayurvedic practices today largely because of tradition and socioeconomic reasons. However, the Ayurvedic practices have been growing in popularity in western culture due to an increasing interest in alternative means of treatment for a number of ailments, as they’re generally healthier, cheaper and don’t come with harmful side-effects. Ashwagandha essential oil shares many of the same properties as the Ginseng root. Ashwagandha essential oil shares many of the same properties as the Ginseng root, which is why it is often referred to as Indian Ginseng. It is a potent natural antioxidant and can be used to increase your body’s natural immunity to infections and diseases – especially helpful during those cold winters, as well as being able to treat a number of other health related issues. The oil is produced from the root of the shrub and is done so through a method known as steam distillation. This is one of the oldest means of distilling essential oils and the basic idea of steam distillation can be traced back to as far as 384 BC, when the Greek Historian Pliny noticed that by evaporating sea water, a purer form of water could be made. In the process, the root of the Ashwagandha bush is harvested, crushed and cut into smaller pieces to help release the essential phytochemicals and nutrients contained in the root. The organic matter is then placed in a large, air-tight vat that is filled with boiling water. As the water boils, steam is produced which extracts the nutrient rich phytochemicals from the organic matter through the process of evaporation. The vapor enters a separate cooling chamber in which it condenses into droplets. The droplets then gather at the base of the chamber, which is usually connected to a flask or has a tap attached to it, ready for further packaging or storage. The liquid that forms at the base of the chamber is essential oil as we know it. 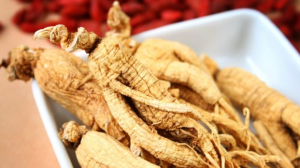 Much like the Ginseng root, Ashwagandha has a great deal of natural antioxidants that make it particularly effective in treating the formation of free-radical molecules which occur during our metabolic process, as well as from exposure to atmospheric pollutants. Free radicals are harmful because they can bond with our body’s natural cells and molecules, and eventually cause chain-reaction-like damage that can lead to serious cell damage and degeneration and have even been linked to the formation of cancer in our bodies. Treating them quickly and effectively is very important. Antioxidants tend to trap the free-radical molecules before they bond with our cells and effectively flush them out of our systems without allowing them to cause any damage to our bodies. Ashwagandha has natural anti-inflammatory properties that can help to reduce the swelling of joints and muscles that are common with old age and those who suffer from arthritis. The oil can easily be massaged into the skin around the affected area and will penetrate beneath the surface of the skin to help treat the affected area. This does not only apply to the effects of arthritis but really to any form of muscle cramps, aches and pains that can be caused by strenuous work or exercise. So it would be handy to keep a vial or container of the oil in your gym bag if you work out a lot and often suffer from cramps and pains. 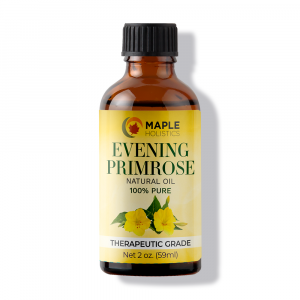 The reason why the oil can treat pain so effectively is because many of the phytochemicals contained in the root have strong natural analgesic qualities. They are also used as active ingredients in the recipes for pain-relievers such as phenylbutazone and aspirin and is often said to be as effective as these, without the downside of the side-effects of course. There are a variety of ways that we can boost our body’s immune system without having to spend loads of cash on costly vitamin and mineral supplements, we simply have to make the effort of finding them. Luckily for you, our website is full of helpful tips and advice on ways to increase your body’s immune system in a natural, holistic and healthy way. The use of Ashwagandha essential oil can help to flush your body of harmful toxins and bacteria that can cause illness, effectively helping your body to remain healthier and stronger for longer. The oil has also been linked to increasing red and white blood cell count as well as your platelets count – the basic building blocks of your immune system. Having a higher blood cell count (of both varieties) essentially means that you have a stronger and more capable natural defense system, and can therefore prevent the development of illness in the first place. Any doctor will agree that prevention is always better than the cure, and we share the same sentiments. Ashwagandha essential oil for depression. Depression doesn’t just happen. It can be caused by a variety of issues or circumstances and can hit anyone at anytime – whether you’re rich or poor, fit or unfit, we’re all basically vulnerable to depression. In fact, many of us may be depressed and not even know it! This is largely due to the fact that it manifests itself differently in different people and that we all have varied abilities and methods of coping with the disorder once it’s there. So what are we to do? Well, the first step of dealing with depression (and in fact, the most holistic option) is to admit that you’ve got it. Whether that means seeking the help and advice of a counselor/therapist or even confiding in a loved one, acceptance is the first step towards dealing with the issue at hand here. A lot of people are either willingly or unwillingly put on antidepressants to help balance the chemicals in their brains and treat this mental illness. However, these are some of the most addictive drugs that can be prescribed and they come with loads of side-effects. In most cases, short of severe and suicidal levels of depression, they should be avoided at all costs or only used in the short-term. Essential oils, and Ashwagandha in specific can be used to help treat your depression and have been proven to do so in scientific studies – so it’s not just spiritual belief at play here. The oil can be inhaled, used in a steam treatment and even as a massage oil to help relieve the body and mind of stress and anxiety as well as stimulate the release of dopamine in the brain. This is the chemical that is effectively our brain’s reward system and is essential to our feelings of pleasure or happiness as well as controlling our sleep cycles. Getting good sleep is key to maintaining healthy bodily functions as restoring the chemical and hormonal balance in our brain. 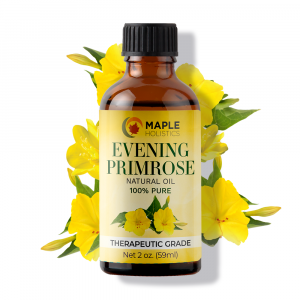 So by using the oil on a regular basis in controlled doses, you can slowly help to treat your depression balance your mind, body and soul. Read on at Maple Holistics: H20 Health, Vitamin C and What is An Anti-Oxidant? In conclusion, when using any natural, alternative or holistic treatments, it’s always important to be in touch with a medical practitioner, an experienced healer or a therapist (in the case of depression here) to monitor your progress and ensure that everything is running smoothly. Even though the natural alternatives to most chemical treatments are healthy and completely safe – making sure that they’re working for you and that your body isn’t having an adverse reaction (in some cases, people might have allergic reactions – although this is rare) is an important part of the treatment. However, most people shouldn’t experience any problems when going the natural route and generally report the opposite. To reiterate what I said in the opening paragraph, you’ve got nothing to lose and a lifetime of health to gain.